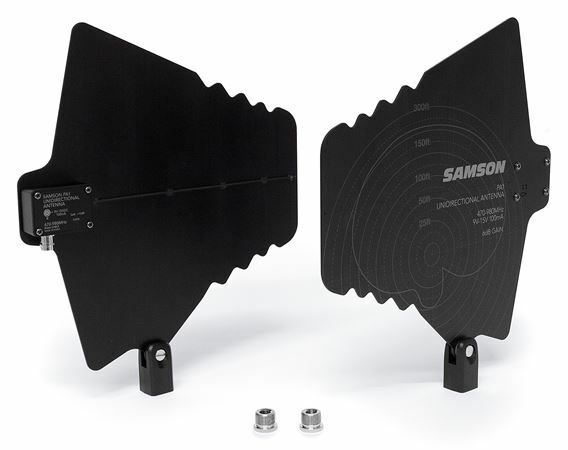 Shop Samson PA1 Active Unidirectional UHF Wideband Wireless Antennas Pair from AMS with 0% Interest Payment Plans and Free Shipping. With the PA1 antennas you will hear every note and vowel by improving your wireless reception. Samson's PA1 Active Unidirectional Antennas are log-periodic dipole array (LPDA) antennas that are designed to improve wireless reception. The PA1s allow you to focus the pickup pattern towards the desired coverage area, increasing the overall range of your wireless system and reducing unwanted RF from surrounding locations/sources. These paddle antennas cover a wide bandwidth and a 470–980MHz frequency range, allowing them to be used for multi-band and frequency-agile wireless systems. The PA1 antennas are compatible with select Samson wireless systems such as Synth 7 and Concert 99, as well as any wireless receiver or antenna distribution system that provides 9–15VDC bias. Each antenna features a BNC connector and integrated amplifier to compensate for signal loss in coaxial cables, especially in long cable runs or when using RF splitters. In addition, the PA1s can be mounted on a stand, ceiling or wall-mount using the included US and Euro mic stand adapters and swivels.